Hi friends! It's Sunday and that means time for a new challenge at The Paper Players. 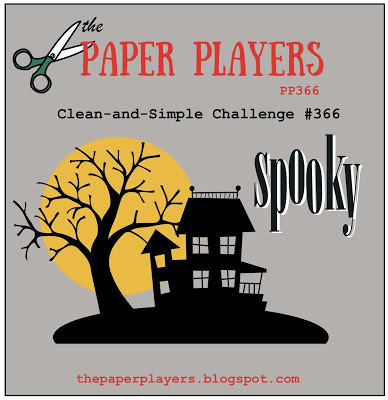 This week our sweet and wonderful Laurie is hostess with a Clean and Simple Challenge: Spooky! Here's my take on the challenge. The bones of the card are quite simple, and I replaced my "white space" with black space. I did spend a bit of time on the background, playing around with distress inks. I used stencil brushes first, then splattered with ink, then watered down ink, then finally splattered again with clear water. It may have taken me a while, but I like the end result. 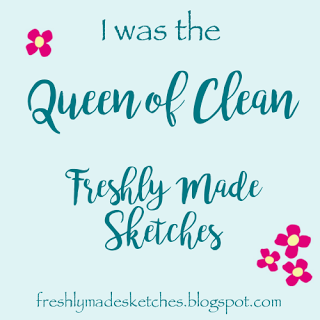 It was mildly messy but fun, and it's kind of spooky, I think! 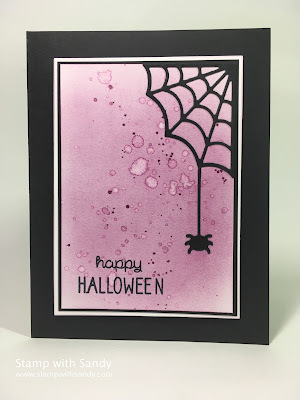 I think your background looks spooky too!It's so much fun to play around with distress inks. Awesome card Sandy! Simple but lovely card. You so effectively answered to the Spooky theme--spiders always seem to do that!--and yet so simple and "clean". This is a fabulous background! I struggle with anything purple, so you were one step ahead of me from the get-go! And a spider too! VERY spooky! 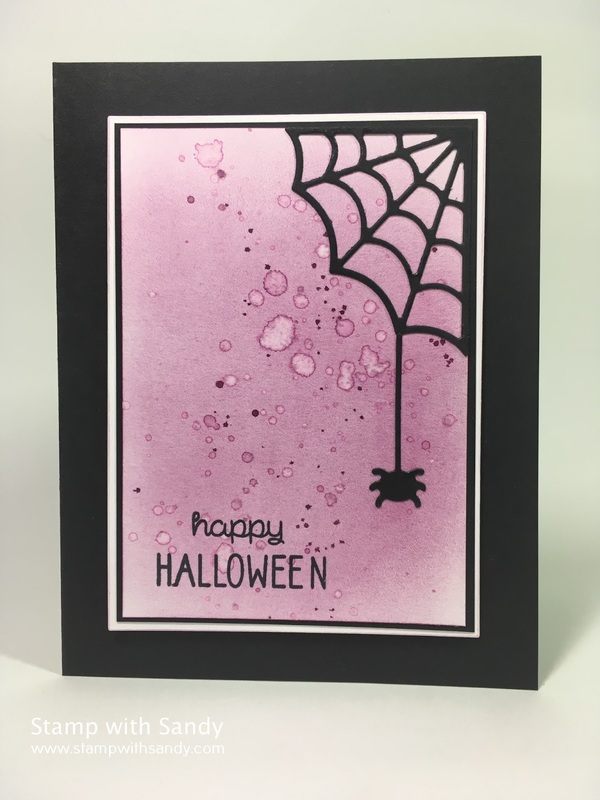 A purple, splattered background is perfect for Halloween and I think spiders make for a spooky Halloween card every time. I just don't like them in my house! Hope you're having a great week! This is a spook-tacular spider card, Sandy! 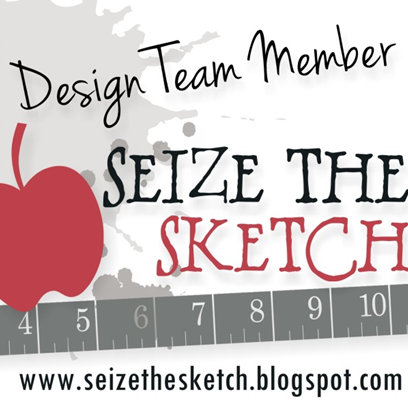 Love your splattered background--the work paid off as all the layers really add so much dimension. And spiders are creepy any time! I just love the purple and black together! SO FUN!!!!!! 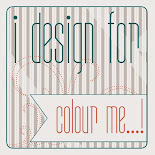 I love that background Sandy and it was well worth the time and effort - it is fabulous! I appreciate the explanation too as this is the kind of thing I struggle to make look like anything other than a mess, so the tips are welcome!! The perfect background for your spider and web. 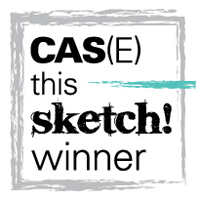 Truly spooky and beautifully CAS!